Unless you’ve been living under a rock for a while you’ve probably heard “content is king.” Now more than ever you have to offer content that’s useful - for both users and search engines. But how do you create, edit, publish and organize all your content? There are lots of great tools out there to help you with this. In this blog post you will find samples of the best free content management tools on the market covering a wide variety of content needs. These tools are fast, free, and easy-to-use, so I hope you find them as useful as I do! But first, let’s talk about what content marketing is and its goals. Content marketing is an important ongoing process of your overall marketing strategy. It requires time to carefully plan, research and manage your content, so it’s important to have the right tools for the job. 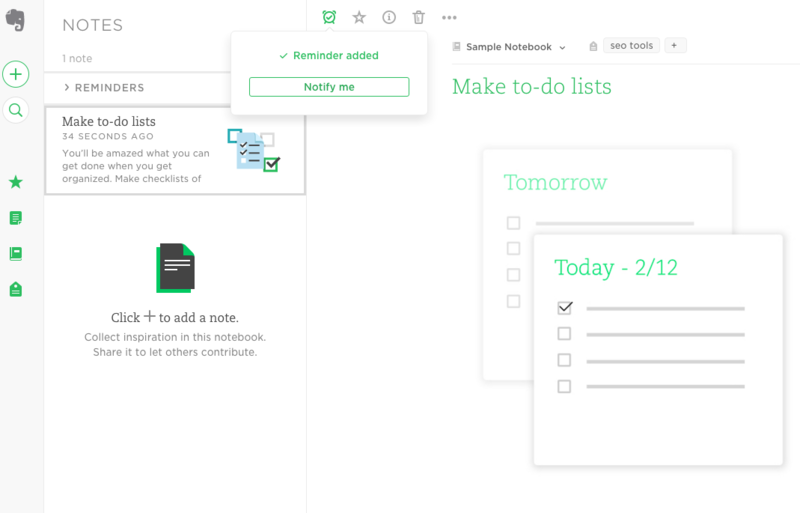 Evernote is a freemium app available for Windows, Apple, BlackBerry, Google and other devices. It’s useful for note taking, organizing information and task lists and setting reminders. You can share your notes with team members or collaborate directly using group notebooks. Tagging your notes lets you quickly and easily find what you need by topic or category. Evernote’s free subscription has a 60 MB monthly upload limit, which resets in 30 days and a note size limit of 25 MB. 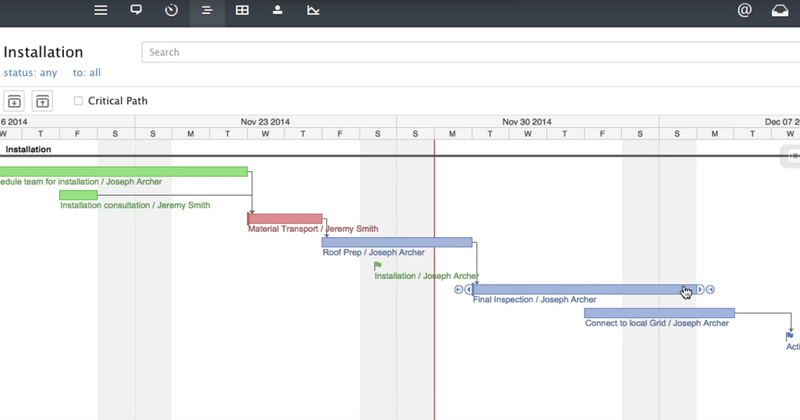 Wrike is an online project management software to help you manage workflow. You can organize your goals into folders or projects to break larger tasks into smaller, more manageable pieces and assign them to individuals to track contribution and progress. There are four plans: free, professional, business and enterprise. 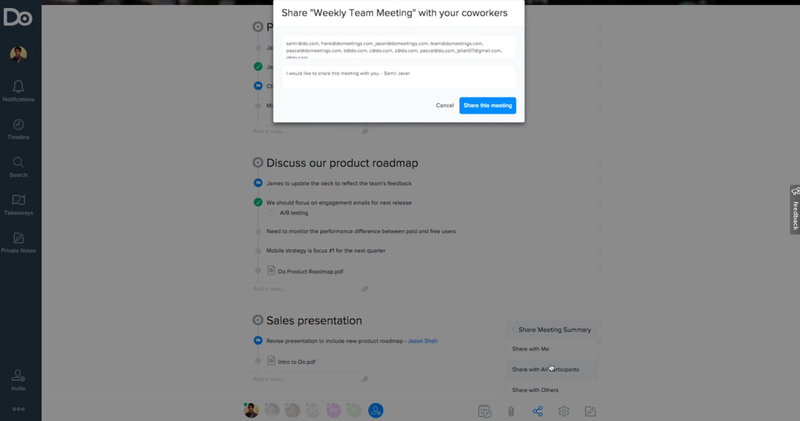 Free plans allow up to five users and enables task management, real-time editing and collaboration, integration with Google Drive, Dropbox and other apps, and 2Gb of storage space. Do is a platform designed for meetings and can be used to plan your business’ content marketing. Use its agenda to create, assign and manage tasks and then export them to apps like Wunderlist and Trello. Do integrates your existing calendar and stores notes, outcomes, real-time collaborations, follow ups and other files in a private cloud for each meeting. The simple UI has a left bar menu with notifications, timelines, templates and a search field. One potential limitation for Do as an editorial calendar is that it limits the user’s view to one day at a time. 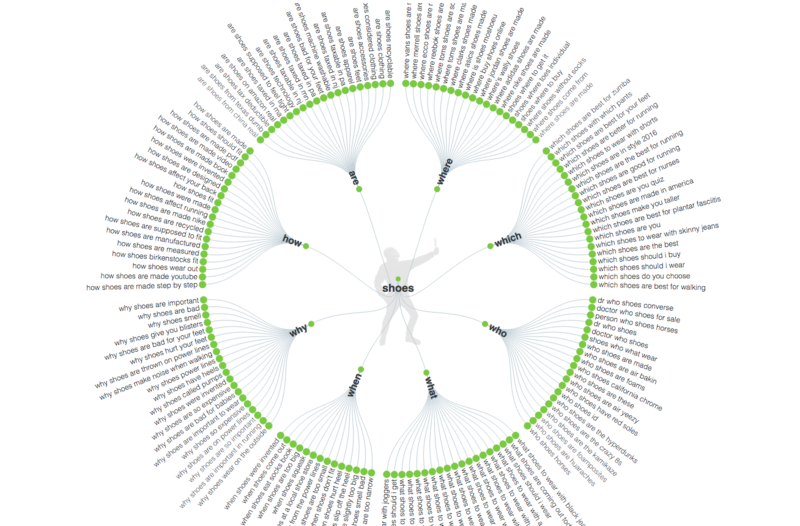 One of the first steps in content marketing is keyword research. RankTank is a resource for free SEO tools and learning materials, including keyword research tools. The tools are available for free (but need an SEMrush API key to get the most out of them). You just need to copy and paste them into a new Google sheet. To use the GooberSuggest keyword research tool just enter a keyword in the Base Keyword field and the tool will automatically populate with Google AutoSuggest keywords. If you have an SEMrush API key you can also see search volume data. 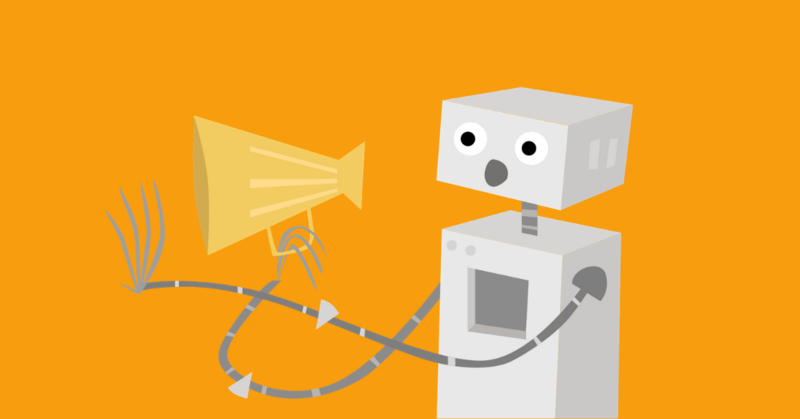 With an SEMrush API key, you can also use RankTank’s Keyword Opportunity Finder tool. Like with GooberSuggest, the opportunity finder pulls potential keywords from Google AutoSuggest and search volume, ranking difficulty and highlighted keyword opportunities from SEMrush. Answer the Public, like RankTank’s tools, uses Google’s AutoSuggest data to find alternate keywords. However, instead of appending every letter of the alphabet like other tools, Answer the Public inserts prepositions in front of and after the keyword. They then use this data to create a visual representation of how people are actually using the keyword to search the internet. You can also export your search data into a .csv file. You can use this information to generate a list of ideas of what to write about based on how your potential audience is searching for your keywords. 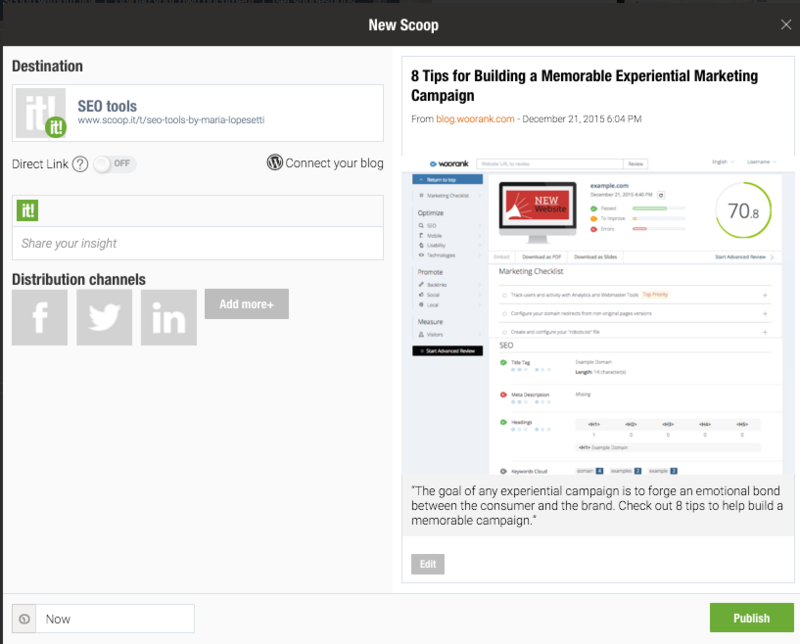 Scoop.it is content marketing software that crawls pages on the Web and curates content based on your specified keywords. You can then either brainstorm your own topics from Scoop.it’s content or curate it to publish on your site. Scoop.it will automatically format your posts to match your site’s layout, but you can edit them at will to add any finishing touches. Scoop.it will automatically curate content for you based on your keywords and will learn over time what content is most relevant and useful to your needs. The free account includes a single user, topic page and keyword group, 2 social accounts,10 scoops per day as well as a basic content filtering/suggestion. Once you log in, they ask you what your business is about, then an array of results linked to your response appear to search and follow topics. 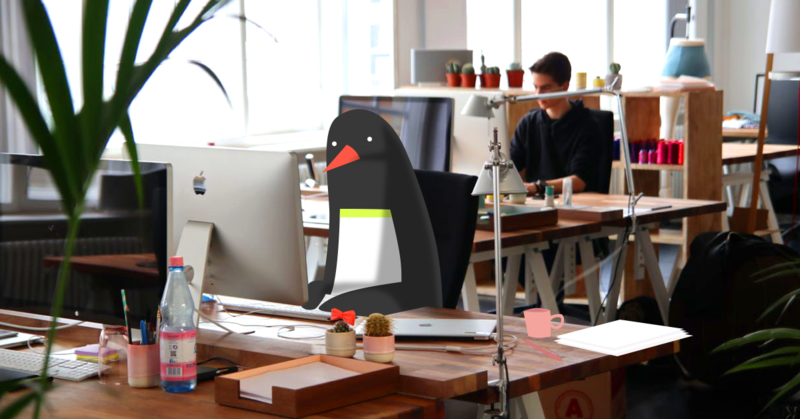 Netvibes is a personalizable content management platform. Users can manage content across marketing channels with a customizable dashboard that includes data like social analytics that you can export into an Excel of .csv file. The highly customizable dashboard makes Netvibes an easy tool to manage content. 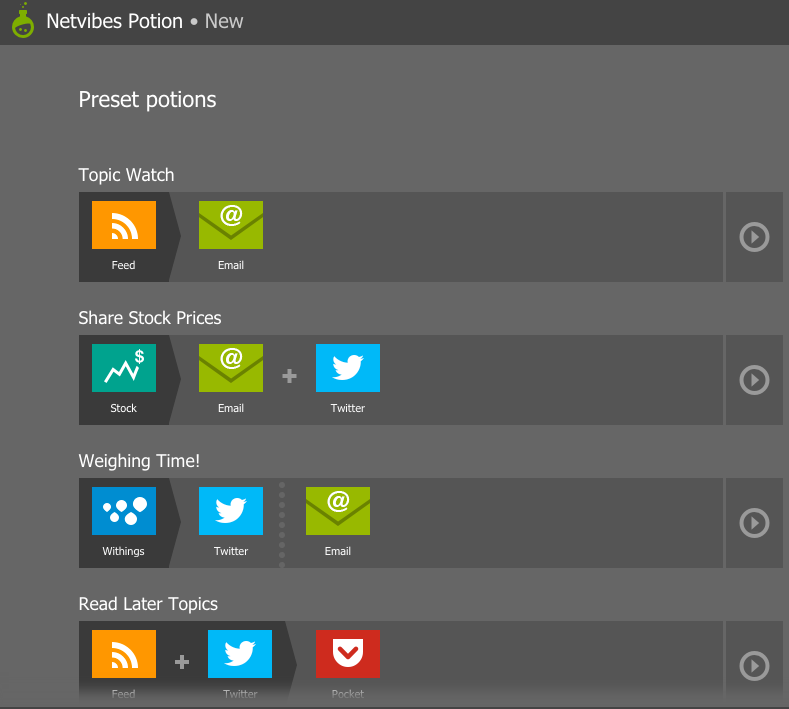 The Netvibes Potion system allows users to create if/then statements to share content across channels. 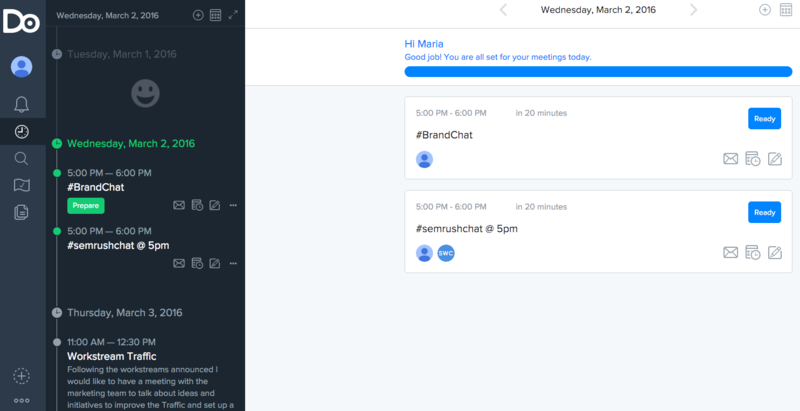 You can automatically share tweets for a client or distribute news or reports to team members. With 70 million visitors, SlideShare is an opportunity for marketers to reach a large audience. Originally designed as a way for businesses to share slides amongst employees, SlideShare has become a platform similar to YouTube, but for slideshows. For content marketing, it offers resources for both finding ideas (it has 18 million slideshows covering 40 topics) and reaching the right audiences - 80% of its traffic comes from targeted search. With such a huge, relevant audience, Slideshare is an opportunity for marketers to build their reputations with their targeted audience. As we’ve mentioned before, duplicate content is always a concern with content marketing. If you aren’t offering unique content not only will your users suffer but you could be left out of search rankings altogether. That’s why it’s so important to make sure you’re not accidentally publishing duplicate content. Copyscape is an online plagiarism detector for websites. Just enter your URL and Copyscape will return a list of websites hosting similar content. Sections of text that match your content will be highlighted in the results. Copyscape is also a good way to protect your content from theft or to verify that any content you buy hasn’t been duplicated. Copyscape also offers the Copysentry service which will monitor the web and alert you when it finds new copies of your content. The visual aspect is an important part of content marketing. A page of solid text is going to turn away even the most determined reader. 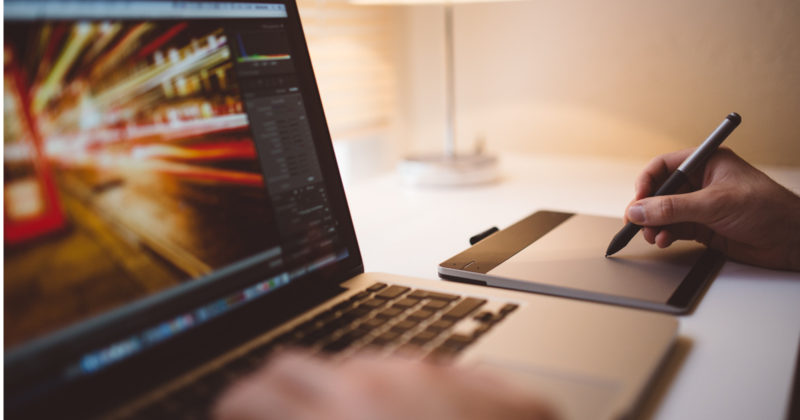 Canva is an extremely helpful tool to create a design for your content platform. You can create images for your site using their library of stock photos, vectors and illustrations or upload your own custom graphics. Personalize your design with Canva’s editing tools including filters, thousands of shapes and icons, and a text editor. If you need help with an idea to get started Canva has suggestions for dimensions and layouts for your use. If you need to create a design for your blog header image the platform will automatically adapt the image to the right size and suggest fonts, colors and pictures for you to use. Their 5 step tutorial is easy to follow and will help users get the most out of their tools. If you just need to find an image ready for you to use, Freepik is a search engine offering a wide variety of vector images, free to use. 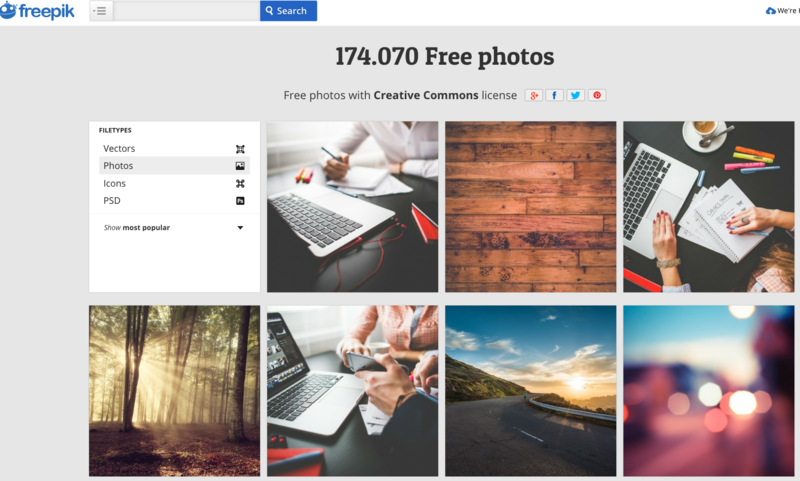 Instead of searching several different free image sites, users can use Freepik, which crawls hundreds of free images sites and returns the ones most relevant to your search. It will also return websites and other resources relevant to your search. 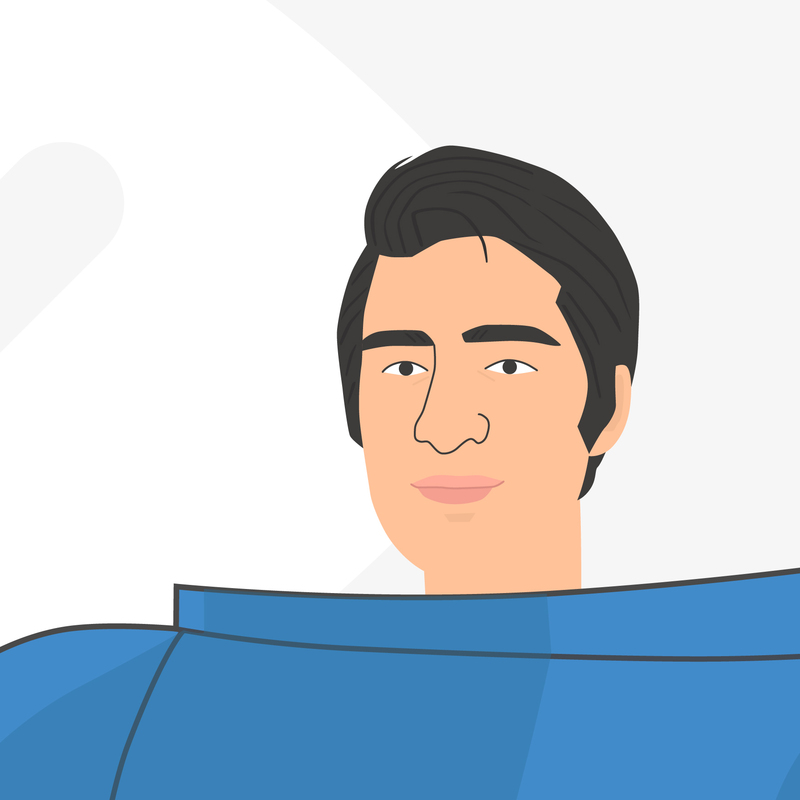 Freepik is a great resource to find photos, illustrations, vectors, PSD, icons and almost any other design need you could have for your content marketing. Google Images is Google’s free image search engine. Just search for a description of what you need (like, say, an image for ‘content marketing’) to find a huge selection of images. It’s important to note that Google Images automatically returns images regardless of copyright. To avoid any usage issues filter in only images labeled for reuse. You can do this after performing a Google Image search by selecting “Labeled for reuse” in Usage rights under Search tools. Planning, researching, creating and designing your content isn't the end of the process. You also have to measure the effectiveness of your content marketing. Content marketing is a constant process designed to attract, convert and retain your audience. You need to provide them with quality and useful content to drive traffic, no matter what type of website you have. Since content is now so important to marketing it’s vital you use the right tools to research, create, manage and design your content. With the right tools you can boost sales, reputation and search result rankings, and as you can see from our list above you don’t need to break the bank to do it. 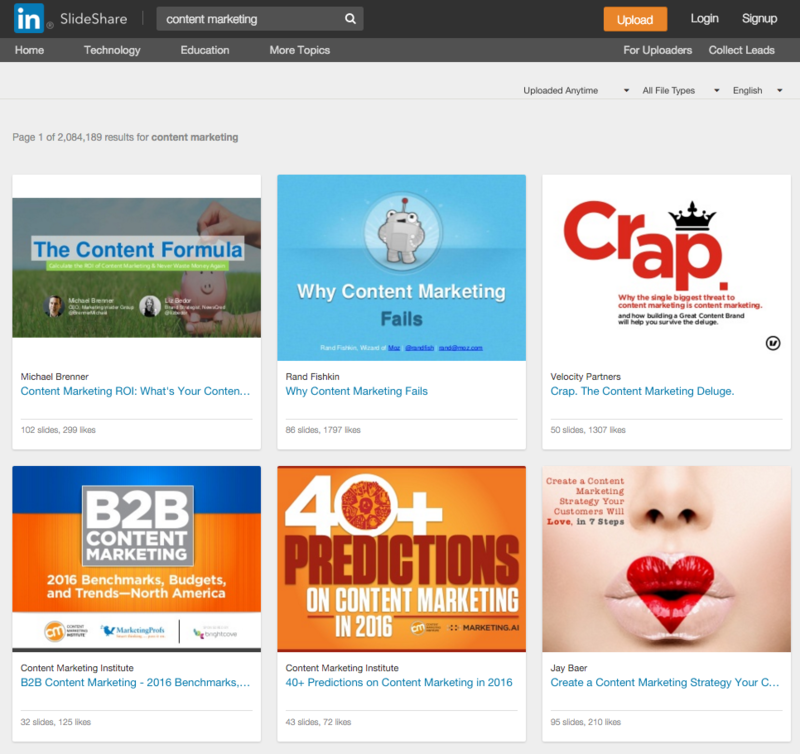 What are your favorite free content marketing tools? Have you found any free tools that have helped give your content marketing a boost?